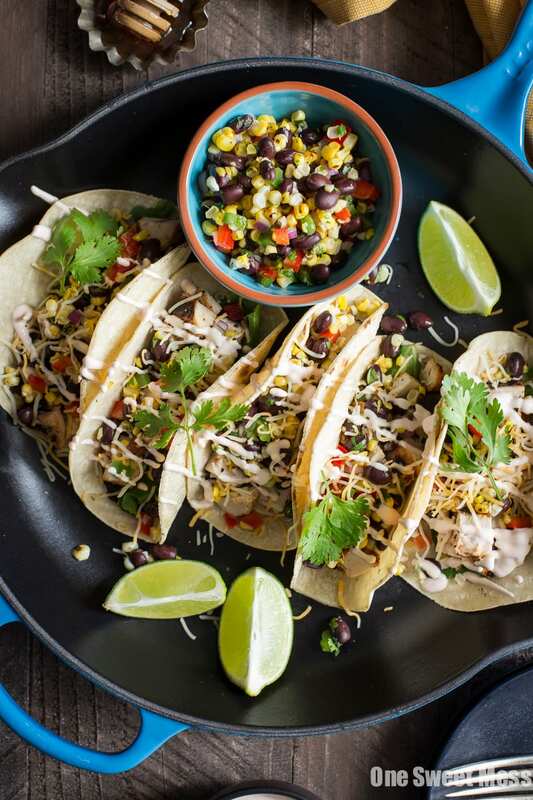 Mesquite Grilled Chicken Tacos with Honey Hot Sauce Crema are easy to prepare for a quick weeknight meal. Back to school so soon. I feel like summer just started, and now it’s coming to an abrupt end–like, “Peace out, I’m outta here. Bye, Felicia!” Oh, Mother Nature, would it hurt you to be nice and ease us in to the situation? Parents, are you looking forward to shipping your children back off to school, or do you get all nostalgic and sad? I’m not a parent, so I really can’t chime in, but I do now this much: if the pup went to doggy day camp, I’d get a whole heck of a lot more work accomplished during the day. If I could negotiate with the dog, I’d do it. Unfortunately, Sully doesn’t take kindly to negotiations. He has major doggy ‘tude. If you follow me on Snapchat, then you’ve witnessed said attitude. He’ll bark incessantly, and if I don’t respond to his barking—thinking, if I just ignore him, he’ll stop—he’ll proceed to howl. Where did I go wrong? Hold on, I know where I went wrong. What had happened was, I decided to laugh at his bad behavior instead of correcting it. Don’t be like me. Bribing almost always works, and I’m assuming it’s the same with kids? Sully responds well to treats. Heck, I’d do just about anything for a bag of black jellybeans and bottle of bourbon, so I guess we’re not all that different. And tacos… I’ll scrub your bathroom with a toothbrush for a plate of these Mesquite Grilled Chicken Tacos with Honey Hot Sauce Crema. Put a plate of these tacos in front of your kiddo(s), and you’ll earn yourself a few precious moments to yourself. I puffy heart these tacos in a major way. It probably has something to do with the honey tequila mesquite marinade. Or, maybe it’s the grilled corn and black bean salsa. Oh, I know, it’s most definitely the honey hot sauce crema. Okay, maybe it’s everything combined and the fact that it all gets snuggled inside a crispy corn tortilla. The flavor and versatility of honey is highlighted throughout this dish: 1.) I added a few tablespoons to the marinade to help balance the tart acidity of the lime juice, 2.) I used it in the salsa to bring out the sweetness in the corn and help tame the heat of the jalapeno, and 3.) I combined it with sour cream and hot sauce to make a sweet and spicy crema that gets drizzled over the tacos. Do yourself a huge favor and make these tacos! In a small bowl, whisk together lime juice, olive oil, mesquite seasoning, honey, tequila, cumin, coriander, smoked paprika, salt, and pepper. Add the chicken to a large zip-closed bag and pour in the marinade. Give the bag a shake to coat the chicken. Refrigerate for at least 4 hours or overnight. Preheat a gas or charcoal grill. Drizzle the corn with canola oil and season with salt and pepper. Place the chicken and corn on the grill. Grill the chicken for 5-7 minutes on each side, or until the juices run clear and the chicken is thoroughly cooked. Grill the corn, turning every 1-2 minutes until all sides are lightly charred. Allow the chicken to rest for 10 minutes before chopping into bite-size pieces. While the grill is still hot, add the corn tortillas. Cook on each side for 30 seconds to 1 minute, or until each side is lightly charred. Remove from the grill and place on top a sheet of aluminum foil. Close the aluminum foil around the tortillas to keep warm. To make the corn salsa, remove the corn kernels from the cob and add them to a large bowl. Add the remaining salsa ingredients and mix to combine. Season with salt and pepper to taste. To make the crema, add sour cream, hot sauce, and honey to a small bowl; whisk to combine. Assemble the tacos by adding a layer of chopped chicken to the bottom of the tortilla. Top with lettuce, corn salsa, shredded cheese, and avocado slices. Drizzle the crema over the top. Serve with hot sauce and lime wedges. First, TACOS. b/c i’ve been taco-ing all summer, but these look superb. Second, i’m a parent, so i’ll weigh in b/c my kid just went back to school yesterday (hence the reason for the *ahem* catchup blog work today). I love her. I’m super emo when it comes to her, but here’s the thing: I’m THRILLED she’s back in school. I miss her, and i’m sure i’d have a super hard time if she were crying, or were scared, or hated it, but she doesn’t. She loves school, which means as much fun as we had this summer, it’s time to go back.